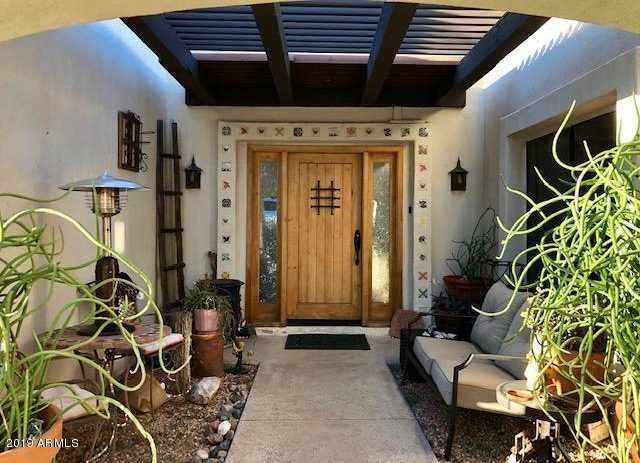 Charming Santa Fe Villa located in the heart of Cave Creek. The kitchen has granite counter tops, stainless steel appliances, barn doors and a large kitchen island with built in wine cooler, wood & tile floors. The remodel turned this 3 bedroom unit into a 2 bedroom with a beautiful family room for added living space. New AC unit was installed in 2017,. Enjoy Condo convenience but with all the spaciousness of a single family home in a park like setting. Community pool, heated spa and tennis. Designed by Bennie Gonzales, each villa has privacy with lots of open space with only 40 homes on 11 acres. The home is located at the foot of Black Mountain, next to hiking trails, shopping and restaurants. Only minutes away from Rancho Manana golfing and Tonto Bar & Grill. Directions: North on Cave Creek Rd turn east on N Skyline Rd, turn left on first street on left. The unit is attached to unit #34 its the 3rd driveway on left. Approximate size: 183.00 sq. ft. Please, send me more information on this property: MLS# 5873753 – $339,000 – 37801 N Cave Creek Road Unit 33, Cave Creek, AZ 85331. I would like to schedule a private showing for this property: MLS# 5873753 – $339,000 – 37801 N Cave Creek Road Unit 33, Cave Creek, AZ 85331.